The little ones may have appeared to be a tad quiet over the last few days. Not so - it is a very busy time for them helping the Easter Bunny. 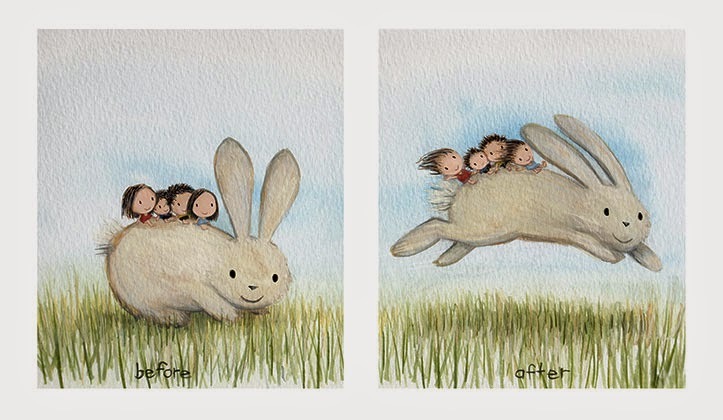 They mainly help by sitting on the Easter Bunny's back and demanding rides. Very helpful indeed. Reminds me a little of book I used to read my children. "Huge Harold" will always be a favorite. I had to laugh when I enlarged the photo and took a good look at the picture. It's great! I hope those Wee Ones hold on tight! Those little ones went flying off everywhere, laughing and giggling and chasing the rabbit.